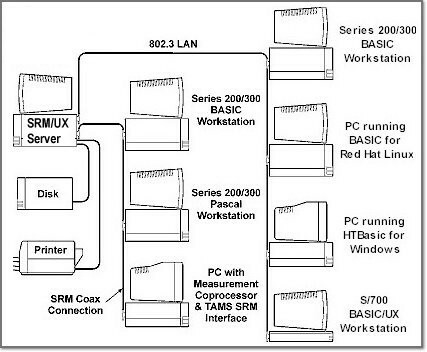 SRM/UX provides networking connectivity for HP Series 200/300 BASIC workstations, Pascal workstations, PCs running BASIC for Linux, and PCs running BASIC for Windows (with TAMS SRM/UX DLL) can all be full SRM/UX clients. It provides file and peripheral sharing, and the server can act as a gateway to provide access to the enterprise network. The HP-UX or Linux host does not need to be a dedicated SRM/UX server. It can also be utilized for other computing tasks. This latest release of SRM/UX expands the Linux kernels supported, while continuing to offer all the functionality of SRM and previous versions of SRM/UX. SRM/UX is supported on almost all HP-UX Workstations or Servers. (Series 300, 400, 700, 800) and Intel based servers running specific kernels of Red Hat Enterprise Linux. All PCs support LAN connections, and Series 300 can support LAN and SRM wire. SRM gateways can be established to connect SRM systems to SRM/UX networks. The E2087 SRM/UX DLL allows PCs running HTBasic for Windows to be full SRM/UX clients. Contact Tech Soft for additional configuration details. Transparent file sharing for your BASIC and PASCAL Workstations. No special commands are necessary. You use the same commands for accessing files, whether on the SRM/UX server or on a local disk drive. HP BASIC, BASIC/WS and HP BASIC/UX can share BDAT, ASCII, and PROG files. You can manage shared data files centrally, reducing revision control problems. Supports diskless booting of HP BASIC or PASCAL Workstation clients from a central SRM/UX server with HP BASIC/WS and Pascal/WS client connections over SRM or LAN interfaces. Ability to integrate 200 and 300 series HP Workstations and Measurement Coprocessors into standard LAN systems. Transparent sharing of files among themselves and with the server, plus the ability to share data with other computers on the network which communicate via standard LAN services. Printers and plotters connected to the SRM/UX server are available to the client computers through normal HP BASIC/WS commands. Easy configuration. Once the SRM/UX system is running, clients can be added or removed without shutting the system down. System Administration of SRM/UX is similar to that of other HP-UX applications, such as the line printer spooler. Backups and system administration tasks can be done centrally via regular HP-UX housekeeping procedures. Measurement Coprocessor must boot from local PC. Upgrade from earlier SRM/UX Version to Version "M"
ATTENTION: Proof of ownership required !